Her Majesty made an unannounced visit Thursday to Royal Manchester Children's Hospital, where she chatted with survivors of the horrific Monday night attack at Manchester Arena. She spoke to victims as young as 12 years old, expressing sympathy, shock and well-wishes. Queen Elizabeth II, 91, stood at the bedside of 15-year-old Millie Robson, who wore an Ariana Grande concert t-shirt as she recounted the terrifying events. She explained that she had won VIP passes in a competition and met Grande backstage before the concert began. Afterward, she was on the way to meet her dad, David, at the arena exit when the bomb detonated, and she suffered severe shrapnel wounds. Minutes later, once her father had located her, he tied clothing around her legs to slow the bleeding. The queen, addressing David, said the atrocity was "very alarming." 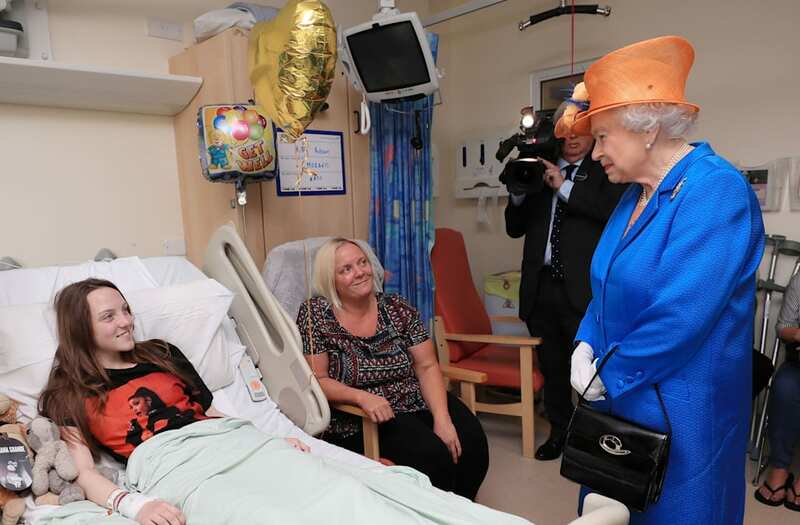 When Millie said that the hospital staff has been excellent, the queen replied, "That is really splendid," according to local reports. After the queen exited, Millie said it had been "surreal" to meet her. The monarch also spoke with Evie Mills, 14, who received the concert tickets as a birthday present. The queen noted that she's a fan of Grande herself, calling her a "very good singer." "It was a dreadful thing," Queen Elizabeth said. "Very wicked to target that sort of thing." Outside of meeting with patients, the queen spoke solemnly with hospital staff, commending them for their relentless time and energy. "The awful thing was that everyone was so young. The age of them," she said to one staffer. Earlier this week, hours after the shocking incident, the queen issued an official statement, calling it an "act of barbarity." Twenty-two people died, including one child only eight years old, in the suicide bombing. UK police have identified the attacker as Salman Abedi, 22, a British citizen with ties to ISIS in Libya. Authorities have reportedly also arrested members of his family and are pursuing what's been called a "network" of extremists operating within the country.